Each year, for the month of November, working men throughout the land unite in their commitment to fine moustachery, to raise awareness of men’s health. Look here to see how Classic FM's presenters got on. 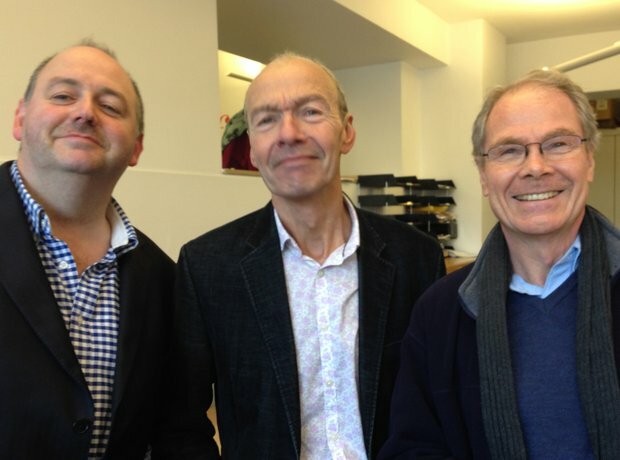 Classic FM presenters (left to right) Tim Lihoreau, John Brunning and Nick Bailey downed their razors on 1 November and stood shoulder to shoulder to document the already fading splendour of their smooth upper lips. More Music Breakfast presenter Tim Lihoreau is striving to achieve the Victorian 'mutton chop' look in the hope that by the end of Movember, plentiful sideburns will unite with a bushy moustache. It's potentially more wistful Wolverine than bewhiskered Wilkie Collins - but only time will tell if Tim's ambition will be realised. It's Movember the 26th and Tim, replete with Victorian facial hair and accompanying civic pride, looks ready to bestow plentiful gifts in an unrivalled act of yuletide charity. Who better to go to for advice on all matters sartorial and tonsorial than Laurence Llewelyn Bowen? Laurence is impressed by Tim's efforts but it will still take some effort to match Laurence's barbate luxuriousness. Will it be a horseshoe or a Pancho Villa? Jamie Crick has also thrown his razor away and is just hoping he doesn't get caught in the microphone muffler. Nighttime host Nick Bailey's off to a modest start but let's hope his lack of exposure to sunlight is an aid to impressive growth. Good effort Nick...don't be intimidated by General Custer behind you. A very respectable mo on the way for John Brunning after almost three weeks. As mo month draws to a close, John takes a selfie and asks, "Should I get the 'mower' out Sunday or should facial furniture stay?"